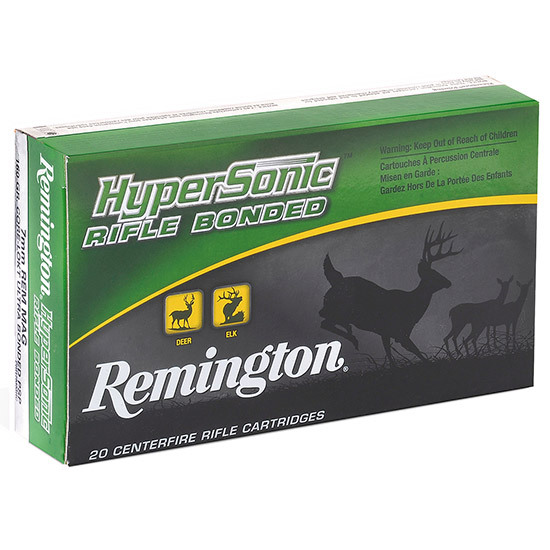 Great for competition hunting or plinking Remington Hypersonic Bonded Rifle ammunition delivers the best performance possible in a centerfire hunting round. Users can expect higher velocities resulting in a flatter shooting bullet that delivers more energy down range. Remington has also chosen a bonded bullet that expands to 1.8 times its original diameter at all distances while still maintaining 95 of its original weight. This results in maximum energy transfer along with great penetration. With all of these features Hypersonic Bonded Rifle ammunition gives the hunter the most versatile load possible with accuracy and ballistic performance over a huge range of distance. This ammunition is noncorrosive in boxer primed reloadable brass cases.